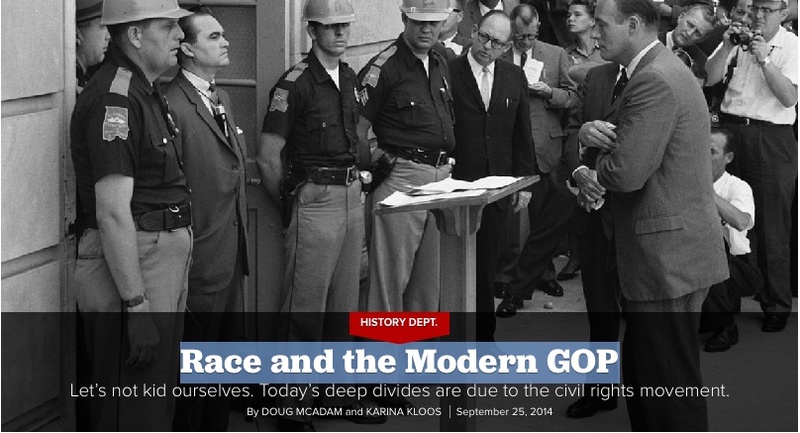 A number of center-right and New Media outlets have noted Politico Magazine's disingenuousness in the opening photograph in its "Race and the Modern GOP" article. At the item's top is the iconic "Stand in the Schoolhouse Door" photo showing onetime segregationist Alabama Governor George Wallace "try(ing) to block the entry of two black students" into the University of Alabama. The aforementioned article title appears beneath the words "History Dept." The magazine is clearly trying to lead anyone not old enough to remember or anyone unfamiliar with U.S. history to believe that Wallace, who ran for president as a Democrat in 1964 and 1976 and as an Independent in 1968 and 1972, was a Republican. The writeup by Doug McAdam and Karen Kloos waits a dozen mostly long paragraphs before finally tagging Wallace as a Democrat. The visual shenanigans are bad enough, but the authors' attempt to cast the past five decades of U.S. political history as almost exclusively the results of reactions, i.e., white resistance, to the civil-rights movement is far worse. It is time to state the obvious. Forget about weak explanations for today’s deep political divisions like “the culture of Washington,” gerrymandering or the rise of cable TV: The civil rights movement, while a victory on many levels, was also the origin of our present morass. It spawned a powerful national “white resistance” countermovement that decisively altered the racial geography of American politics, pushing the national Democratic and Republican parties off center and toward their ideological margins, undermining the centrist policy convergence of the postwar period and setting the parties on the divisive course they remain on today. Many will blame today’s unprecedented political polarization on recent events, such as the rise of the Tea Party or Obama’s election in 2008, but they will be wrong. The seeds of America’s dysfunction were planted 50 years ago. And the ugly politics of race had everything to do with it. ... by the mid-1960s, the GOP’s ideological center of gravity was shifting right to accommodate the growing number of whites angered and frightened by the assertiveness of black protesters. What McAdam and Kloos refer to as "assertiveness of black protesters" was known at the time as "race riots and lawlessness." Whites of good will had every reason to expect that the passage of the Civil Rights Act of 1964 and the Voting Rights Act of 1965, when allowed to work, would lead to more racial harmony, not less. But it didn't, and it's crucial to note, to paraphrase Billy Joel, that they "didn't start the fire." As I noted in a column posted elsewhere in July on 1964's "Freedom Summer" voter-registration effort in Mississippi, much of what had been the civil rights movement fell under the spell of radicals who wanted to see nothing resembling an improvement in race relations materialize. The architects of Freedom Summer were shrewd, pragmatic veterans of a brutal street fight ... they wagered that if white students from prominent Northern families were arrested, beaten and illegally jailed—as they fully expected they would be—the federal government would finally recognize its responsibility to intervene in Mississippi. In other words, naive white college students were to be used as guinea pigs to get the nation's attention. The desired "blood sacrifice" occurred in June of 1964 even before they arrived, when three civil rights workers — two of them from the sought-out "privileged group" — were murdered. No wonder the Rev. Martin Luther King, Jr., whose nonviolent approach was already well on its way to being despised by the true-believing radicals, was not involved with Freedom Summer. If Freedom Summer's organizers were truly interested in racial harmony, they would have allowed the administration of Lyndon Baines Johnson the time to go after recalcitrant Southern states and generate tangible results. LBJ had clearly signalled that he was all-in for enforcing the newly passed Civil Rights Act, and followed through vigorously. But the radicals had no interest in allowing enough time for the positive efforts of LBJ to become nationally visible. We now know that Freedom Summer was deliberately concocted to foment violence. The race riots of 1964 which followed shortly thereafter "just so happened" to occur in Harlem and other areas near New York City, where many of Freedom Summer's instigators made their homes. It is also reasonable to believe, as I wrote in July, that those riots were likely "proactively fueled by people determined to ensure that the legitimate civil rights movement’s milestone accomplishment would not work out as hoped, and that race relations would not improve." The radicals got the racial divisons they were looking for. It certainly isn't whites' fault that, alarmed by Democrats' coddling of criminals and indifference to civll order, they felt they needed to look elsewhere to find politicians with basic values more in line with their own. And it isn't their fault that the race hustlers who arose from the ruins of the mainstream civll-rights movement continue to wear media-manufactured halos even as they continue to divide the country along racial lines and alienate well-intentioned citizens of all races, creeds, and colors. Shame on Doug McAdam and Karen Kloos for presenting the left's dangerously wrong racial mythology as some kind of settled truth.